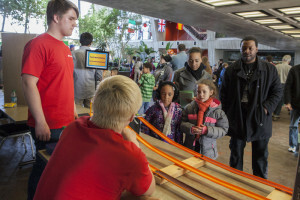 The Family Open House is one of the most popular annual events hosted by the U.S. Department of Energy’s Fermi National Accelerator Laboratory. And this year, there are plenty of new wonders for kids of all ages – even those who have been to the Open House before – to enjoy. This year’s event will take place on Sunday, Feb. 8, from 1 to 5 p.m. in Wilson Hall. It will include activities for the whole family, from hands-on science exhibits to tours of some of the lab’s attractions. There will be a series of performances by Jerry Zimmerman, the ever-popular “Mr. Freeze,” demonstrating the (very) cool effects of liquid nitrogen, and about a dozen scientists will be ready to answer questions in the exhibit area on the 15th floor of Wilson Hall. For the first time, Fermilab’s brand-new operations center on the first floor of Wilson Hall will be accessible for the Open House. Many of Fermilab’s experiments are controlled from this room, and there will be operators at their stations, all of them ready to talk about the work they are doing . In the atrium, families can enjoy a “physics carnival,” including interactive exhibits by students from four local schools: Naperville Central High School, Carl Sandburg High School in Orland Park, St. Charles East High School and Glenbard South High School in Glen Ellyn. This year, in addition to tours of the linear accelerator and main control room, there will be two special tours on offer: one to see the 50-foot-wide Muon g-2 electromagnet that was transported from New York in 2013, and one to visit the DZero detector and the Tevatron ring. DZero is one of the two main experiments that ran on the Tevatron for two decades. It was decommissioned in 2012, but it still stands as an example of the complex technology of particle detectors. Tours of the linear accelerator and main control room will be given throughout the day. Attendees will need to register in advance for the Muon g-2 and DZero tours. These tours will fill up fast, so those who want in should register quickly. There are a limited number of seats available, and standbys will be accepted. More information is available behind the link. Additionally, this year’s Family Open House coincides with the Art@CMS exhibit in the Fermilab Art Gallery, including work from eight artists inspired by the CMS detector at the Large Hadron Collider. The exhibit includes a life-size 2-D reproduction of the five-story-high detector, attached to the balconies in Wilson Hall. For more information, visit our website. The Family Open House is free of charge. More than 2,000 people are expected to attend this year’s event. The Family Open House is made possible by an anonymous donor to the non-profit Fermilab Friends for Science Education organization. Fermilab is America’s premier national laboratory for particle physics research. A U.S. Department of Energy Office of Science laboratory, Fermilab is located near Chicago, Illinois, and is operated under contract by the Fermi Research Alliance LLC. Visit Fermilab’s website at www.fnal.gov, and follow Fermilab on Facebook at www.facebook.com/fermilab and on Twitter @FermilabToday . The DOE Office of Science is the single largest supporter of basic research in the physical sciences in the United States, and is working to address some of the most pressing challenges of our time. For more information, please visit science.energy.gov .